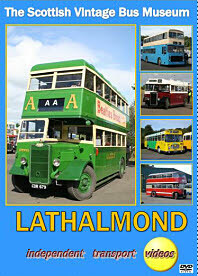 The Scottish Vintage Bus Museum based at Lathalmond near Dunfermline is a gem for the bus enthusiast, featuring preserved buses and coaches from all over the British Isles, but majoring on the fleets of Scotland in the years gone by. Our cameras visited here in 2005 and 2009 to record the events of the Open Weekend that is a must on the enthusiasts calendar in mid August each year. We open the programme in 2005 at the Rally site, showing some of the attending vehicles before jumping on board a 1943 Guy Arab II CDR 679, restored to a wartime grey livery for the brief run to Dunfermline bus station. At the bus station we linger to record the modern day operations of Stagecoach Fife. The return to the site is on board another Guy Arab, this time mark III GVD 47, a Duple bodied example that used to operate with McGill’s of Barrhead. Another feature of the Open Weekend is the Sunday morning road run through the beautiful Fife countryside. We travel on former Bristol Omnibus, Bristol RELL6L 1257 (DAE 511K), smartly turned out in Badgerline livery. This combination of Bristol/ECW vehicle was rare in Scotland, with only Alexander Fife operating the type! Our return in 2009 is covered in more detail, with a good deal of the operation on the rally site being recorded over the two days. Look out for CDR 679 out of its wartime guise and now repainted in the rich colours of AA Motor Services of Ayr. Also Blackpool Corporation Leyland Titan number 501 displaying a different route destination on each run it makes on the internal bus service! Rides to Dunfermline this time are provided by the former China Motor Bus, Alexander bodied Guy Victory 2 for a return trip, and the beautifully restored Central S.M.T. Bristol Lodekka LD6G, B87, for a one way trip to Dunfermline. An interesting comparison of vehicle types for you to enjoy. This video will make a superb companion to our ‘Scottish Weekend’ programme that features previous visits to the Museum and also Glasgow and Edinburgh in recent years as well as ‘Edinburgh Buses’ with film and photographs from the 1960’s through to 2009. Duration : 98 minutes (approx).